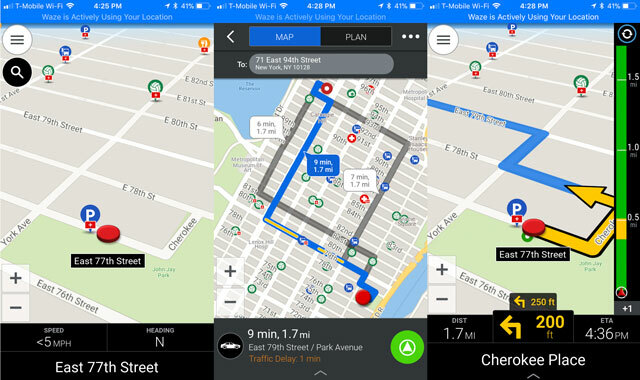 A solid navigation app offers turn-by-turn directions, bicycle routes, traffic updates, and access to offline maps -- crucial if you need to preserve data and iPhone or Android Phone battery life. And if you're after extra features, there are apps for finding the quickest way to hit dozens of stops, apps for planning the ultimate road trip, and apps to navigate you around traffic jams. We've rounded up five of our favorite navigation apps below. Let us know in the comments if we've missed your go-to. This full-featured navigation app has extra oomph in the traffic alerts department. It crowd-sources traffic information from other drivers using the app, with a friendly map interface that shows icons for accidents, hazards, road closures, speed cameras, and police officers waiting for the next leadfoot to whiz by. Red lines show how long traffic jams extend for, and the app can automatically reroute you to an alternate path. You can help other Waze users out by reporting nearby traffic conditions, including a handy feature to add a photo and a note about whether the trouble is on your side or the opposite side of the road. The search function works with places as well as addresses and suggests places based on your location and previous entries. You can also navigate to car services, public transport, restaurants, shops, and more by leveraging Google and Foursquare. Once you select your destination, Waze comes up with alternate routes you can take and remembers preferred routes after you drive them a few times. And, you can create a Planned Drive by entering the time and date you need to arrive and Waze will recommend the best time to leave. A nice touch: you can send your ETA by email, text, or Whatsapp to your contacts, and sync Facebook and phone calendars so that upcoming events appear in the list of navigation options, including Planned Drives. But: Some of the user-submitted info isn't comprehensive or edited (for example, place names might not be capitalized). 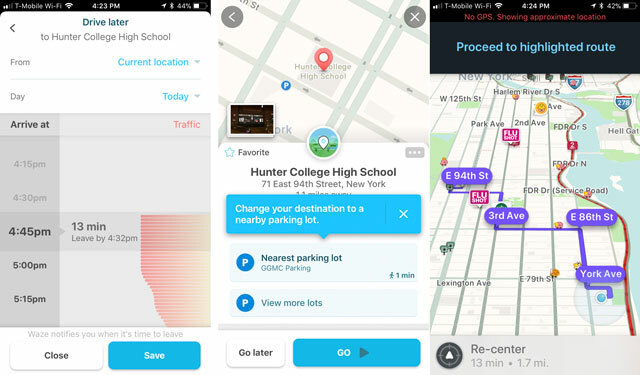 For-pay navigation apps don't have a great case against freebies like Google Maps and Waze -- except when it comes to offline use. A full-fat nav app like CoPilot GPS is a good idea if you're overseas, for instance, and don't want to use roaming data or depend on Wi-Fi stops to update Google Maps. 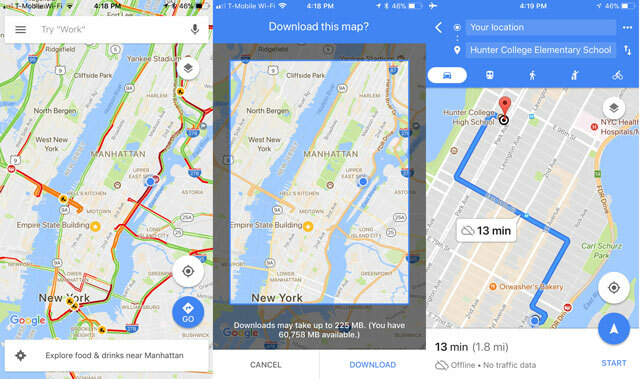 You'll only need to download maps once -- ideally over Wi-Fi as they're fairly data-heavy -- but once that's done, you can get turn-by-turn voice directions, plan new routes, and use Google-powered search to save new places or addresses for when you're offline. Along with a clear interface showing the next two turns, you get lane guidance for highway driving. And if you end up missing your exit, the rerouting feature quickly gets you back along your way. The app also logs your speed, with warnings when you're nearing the limit, and shows speed camera locations. Its price tag includes 12 months of ActiveTraffic, which finds the quickest routes based on live traffic info. But: If you don't often drive where you can't access the internet, CoPilot may not offer much more than the free Google Maps. Apple Maps, preloaded on iPhones, may have improved its data accuracy since its wobbly launch, but as a mapping app that still eschews cycling routes, it loses out to Google Maps for everyday navigating. You open Google Maps to figure out where that bar or restaurant is and tap the navigate icon in the bottom right of the screen to instantly give you a few routes from your current location. You can also tap “Explore Nearby” to see the best user-rated restaurants, bars, and entertainment, along with a filter for how long you're willing to walk or drive to get there. And, you can search within your route for nearby gas stations, coffee shops, restaurants or anything you need and add it to your current route. 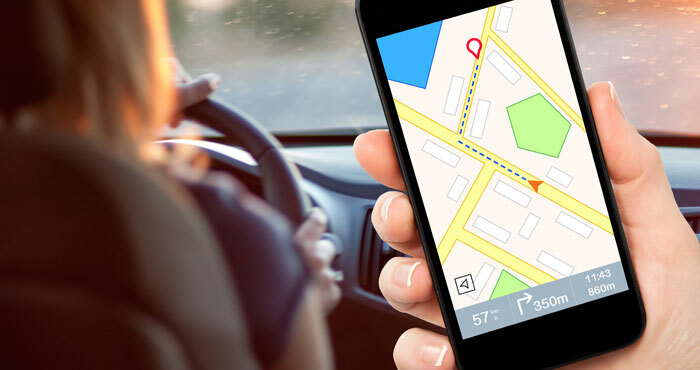 The turn-by-turn directions are well-timed, while the search function is top-notch, with auto-suggestions and predictions based on past searches. Once you're on your way, the app continually checks the speed of alternate routes, popping up options to switch to faster ones when they're available. 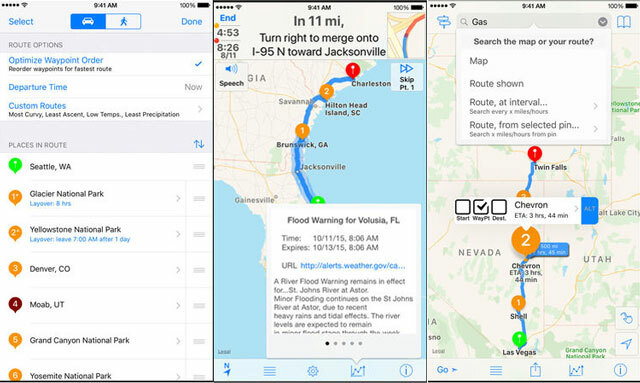 If you're going to be navigating without a data connection, you can save maps for offline use, complete with voice directions. Maps expire after 30 day, though, so you'll need to make sure you've refreshed your maps if you're going to be without cell service. But: No speed camera warnings. 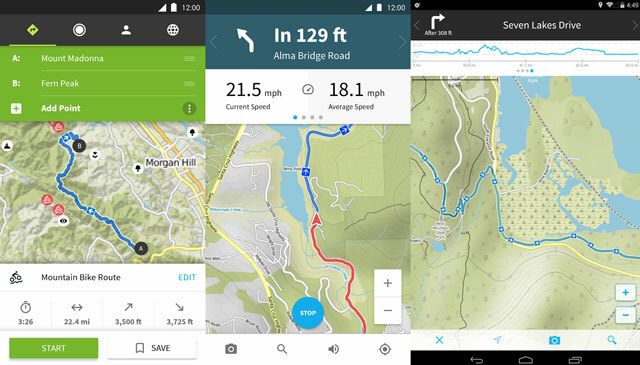 This navigation app covers an exhaustive range of North American bike paths and mountain trails, with topographic maps for hiking and biking routes near you. Its database is built from open-source info as well as user-submitted data to suggest trails for different fitness levels. Since you're (hopefully) going to be out of radio contact, it's extra handy that the maps and turn-by-turn directions work offline. You can also check out factors like difficulty, surface, elevation, and distance along a particular route. And while navigation, the interface shows your pace plus distance traveled and distance remaining. The first map (with voice directions) is free; after that, maps cost around $3.99 for one region (basically a city or county); $29.99 for the All-Regions package (which currently includes most of Europe, U.S., Canada, plus some countries in Asia). Updates are free. You'll love: The greater the number of trips you take with Komoot, the better it can recommend trails for your fitness level. But: The area defined by a Komoot “region” isn't large, so if you're an infrequent hiker, the cost of purchasing extra regions might not make sense. We've used Google Maps to smoothly navigate thousands of miles' worth of road tripping, but when it comes to the planning of a multi-stop, non-direct trip, inRoute has the search giant beat. The free version allows you to plot a route with up to five stops through an intuitive map interface: Drop pins on places you want to go and the app figures out the route. A cool search feature lets you hunt for places of interest such as a gas station or restaurant within a particular distance from you, or at regular intervals along the way. You can adjust when and where you drive based on extra info gleaned from live-updated weather condition charts, as well as the curviness and elevation of various parts of the route – handy if you're driving an eight-berth RV and want the straightest possible roads (or a motorcycle and want the opposite). But it's the $14.99 upgrade to Premium that unlocks the real road-trip magic: the ability to add up to 25 stops (or up to 100 stops with Pro for $29.99 every year), along with the amount of time you want to stop in each place, and an optimization feature to reorder your stops into the fastest, most fuel-efficient routes. It's perfect for planning road trips. You'll love: Being able to plan a looping route that hits up various destinations before ending up back at your starting point – gas stops, breaks and sleeps included. But: You have to upgrade to get directions and the app only gives you one route. However, you can export your route to another navigation app, such as Google Maps or CoPilot, if you upgrade. My Sprint phone came with Scout for navigation and I’ve used it religiously ever since. It typically provides several route alternatives, built in traffic reporting and just does a dang good job. The title basically says it all but curious about this. I am not happy with Google Maps that came on my phone so I have been trying others. I tried Scout for a week and I had some bad directions, lots of traffic, including not being able to get back Home! So I uninstalled Scout and am looking again. What are you not happy with on Google Maps? I use all the time and have found it to be very easy to use and it’s pretty full featured. If you don’t like Google Maps, try Waze and see if that is better for you. Even “avoid highways” doesn’t get the job done. Mostly because the parameters, wanting to make a bee-line, again are magnetized to the highest trafficked roads, and seem blind to obvious routes (that connect a route before and after a downtown, but circumnavigate said downtown) that can be seen on a paper map. GPS has tunnel-vision. I wish I had the coding knowledge to make such an app. I only have the idea, not the way to make it happen. As far as parameter behavior goes, I imagine something like a taxi meter that charges $0.01 per mile, but $10.00 per minute, guaranteeing that the program wants to avoid wait time, not avoid longer mileage or overall longer time. It wouldn’t replace traditional GPS or “fail” as a “good” GPS, but offer an alternative TO them. hi, thanks for the article. what do you make of HERE? (disclaimer, I used to work for them a few years back). they have offline maps for all over the world with turn by turn navigation, traffic, walk, public transport, places information and other stuff and they are actually entirely free to use both in online and offline mode. I’ve using HERE maps (formerly Nokia Maps) since it only existed in Symbian. I’ve been using the ‘Here’ maps for two phones now. First it came installed on my Nokia Lumia 520, when I upgraded to the Nokia 1020 I had to update them - it took a while, but well worth it. Love the HERE maps/GPS system. Hi, I would say you did not use those apps what so ever or just didn’t compare with standalone navigations. You missed one but important issue. They are not so fast. Yes waze is good for trafic jams but the app is so slow. If you dont know the road and you depend on navigation waze will tell you to turn way after you pass the turn. Here is not speaking properly. Sometimes the voice guide is on cofee brake. I’ve been mapping since before there were map app (mapps?). These mobile maps have changed the outside sales game. I used to have to physically map my routes the night before and had to struggle through creating the fastest routes to all my points. Optimization wasn’t the only issue, but also traffic. The opportunity cost of two hours spent in LA traffic is unimaginable. Mobile apps have completely solved both my issues. I use Badger Maps and Waze (which are integrated, thank the lord) to optimize and then route my daily trips. Google Maps is on the list and is clearly the leader of the map app (again, can we make ‘mapp’ a thing?) game, but it is just too general for my use. I need to visit 20 places in a day in the most efficient way and avoid traffic getting there. Glad to see that Waze is at the top of the list. Doesn't it also work with Google Maps? I’m using them for outside sales too but I’m using google maps. Cool that there are options. Thoughts on HERE? They do maps for most auto nav systems on the market and are ranked by the auto industry as the best quality? Does anyone know of an app that shows block or house numbers? I really need one for work. Here shows house address numbers if you zoom in and use satalite. You stated that one needed to export maps created in inRoutes to Google Maps in order to navigate the custom map. That is incorrect. Google Maps does not have the capability to navigate custom maps - it can only display them. what about here maps/here we go. this app is wonderful it came pre-installed on my windows 8 smartphone. i switched to android & the first thing i did was go to play store & download it. I’ve been using Waze for nearly five years, and it just keeps getting better. Besides what was mentioned, it also allows you to report gas station prices, gives you the speed limit and whether you’re going under or over, quickly reroutes you when you miss a turn, and allows you to take pictures of the street view of a place so you know when you’ve arrived. It did used to have an add-a-stop feature, which was handy but could be clunky. Rather than improving it, they scrapped it altogether. Since this app is crowdsourced, if there’s a new street just opened, you can “pave it” on the map by pressing Pave and just driving down it. Though there’s no “left lane closed” button, you can use the construction function and type it in. It seems like this app has it all. Except now it added ads. Easily dealt with, though—tap the screen (not on the ad), and it goes away. Hi, I use Google Maps when I have good data connection. But often I need to plan my route in advance or navigate offline and use rather Mapfactor Navigator. ...it’s a data gobbler. Before you use it, you’d better double whatever data rate you’re subscribed at, and be ready to bump it up when your carrier gives you a “you’re nearing your limit” warning. Unless you’ve got unlimited data, in which case, go to town! Any options out there for customising routes? If you use Google Maps on your laptop, you can drag and drop your route. Click anywhere on the bright blue path to set a point and then drag it to the turn you want to take. Google Maps will automatically snap it to roads, so you just have to set the turns. It’s not as clean as you would like, but you can set waypoints along the route to your destination, and customize those waypoints to force the app to route you the way you want (or at least very close to it). Depending on how much your desired route differs from the calculated route, you may only need to add one or two waypoints. You can set pins (waypoints) and if you took an alternative route from one point to another you can set another pin along the route you took to get the miles. I am a truck driver and I use it like this all the time! I’ve been using Sygic for Android for several years, as have my family and several friends. We’ve all been very pleased with its features and the number of map updates and program enhancements that are issues each year. This website is absolute usless. Using this app I actually had to get out the atlas. Won’t even tell distance to stops or starts borders. Don’t waste your time, download a better app. Don’t want to get lost in the applications using this pos app. Would have been nice to know the three state lolive was 5 miles rather than than what looked like 30. F you Google maps! I frequently travel to the Williamsburg, Va. area from the Richmond area. Every navigation app I’ve used routes me on Interstate 64 which I HATE. Traffic is always awful as this is the main route to Va beach. I prefer Rt. 60 which usually has little traffic and is just a more pleasant route. Problem is all the way down 60 navigation is constantly trying to reroute me to 64. On Mapquest for PC I used to be able to click on 64 and tell it to avoid 64 and I would be routed to 60 or 5. Is there a GPS app that let’s you avoid certain specific roads? Telling it to avoid highways doesn’t work as part of my return route does require highways. I like using GPS even when I k ow the route for traffic and speed. Are there any privacy friendly digital mapping apps in terms of the least amount, if not none altogether of collecting, storing, sharing, and selling of personal data analytics? At which if not, why hasn’t any privacy conscious minded team of software developers filled that niche of the gaining desire of the digital privacy paired with digital mapping/navigation market? Seems like a wonderful software startup company with a lot of growth ahead of them.